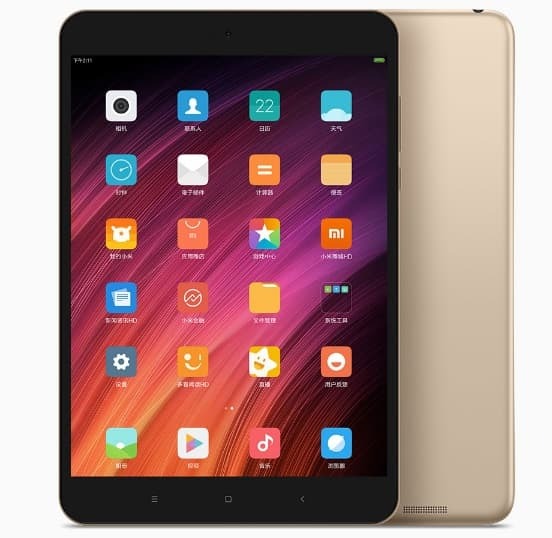 The Mi Pad 3 comes in an all-metal casing and features a Champagne Gold color avatar. It has a dimension of 200.4x132.6x6.95 mm and weighs roughly around 322 gm. A 7.9-inch Retina display with a pixel density of 326 ppi is what it all has to offer and with a resolution of 2048 x 1536 px, it seems to compete with that of the likes of Apple. The device is powered by a hexa core 2.1 GHz MediaTek MT8176 processor and is supported by a 4GB of LPDDR3 RAM. It has a 64 GB of ROM but with no extended memory support, which is one of its biggest disadvantages. It runs Android Marshmallow 6.0 as its OS with Mi Ui8 skin and is expected to support Android Nougat update. Optics-wise, the device has a 13 MP primary rear camera with f2.2 aperture. A front camera of 5 MP with f2.0 aperture is also present. Though the front one is ideal for capturing quick snaps and selfies, the rear one supports 1080p HD recording without any lag. Connectivity wise, the device supports 4G LTE, Wi-Fi 802.11 ac, Bluetooth v4.1, GPS etc. It also has USB type C tethering feature which further supports 5V/2A fast charging. The device has a 6600 mAh battery which though adds enough weight but delivers 867 hours of standby with up to 12 hours of browsing. Hence, at a price of CNY 1499, the device has a lot to offer. Though Xiaomi has not yet announced its global release, the device is expected to soon reach to the global market. India never experienced the feel of Mi Pad 2, however, with the fan following Mi has now, chances are Mi Pad 3 could also feature in India in the distant future.